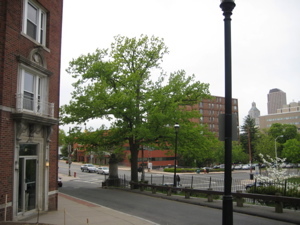 Now, you didn’t think I’d learn all about the Charter Oak over at Museum of Connecticut History or the Old State House earlier and not check out the actual site of the tree, did you? For shame. A quick drive (it was raining fairly heavily and it IS about a full MILE away!) over to the Charter Oak Avenue and Wyllys Street intersection got me to my quarry: A run-down tiny grocery store specializing in 40 ounce malt liquor. Oh, and the site of the Charter Oak! 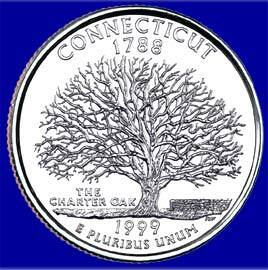 “In 1662, Connecticut received its Royal Charter from England’s Charles II. A quarter century later, James II’s royal representatives attempted to seize the charter. 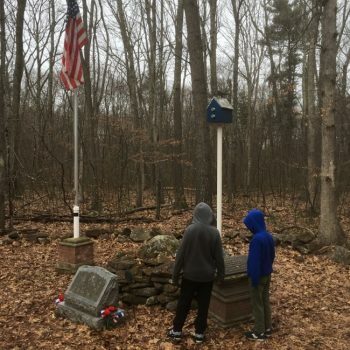 Well, our Connecticut forebears were not about to take that lying down, even though the Brits threatened to split the state and divide its lands between Massachusetts and New York. 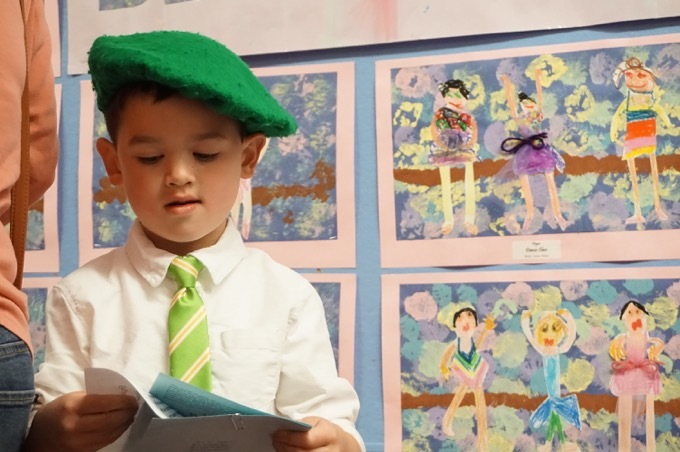 Was it an accident, or a crafty maneuver carefully plotted by the feisty defenders of Connecticut’s rights? We may never know, but what we do know is that one passionate Nutmegger, Captain Joseph Wadsworth, who was positioned outside the tavern, found himself in possession of the Charter during the ensuing chaos in the darkness. 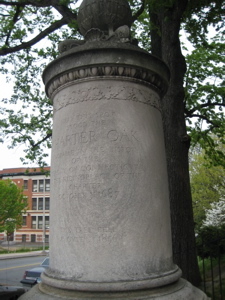 Wadsworth took it upon himself to hide the charter safely inside a majestic white oak tree on the Wyllys estate in Hartford. The stately tree was already more than 500 years old when it served its spectacular role as a hiding spot for the precious document. Wadsworth’s bold move served to preserve not only the document but the rights of the colonists. 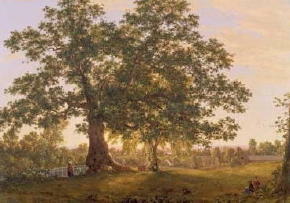 Thus, the tree earned its nickname–the “Charter Oak.” The venerable tree stood as a proud Connecticut symbol for another 150 years until it was toppled during a storm on August 21, 1856. Now, the symbol lives on thanks to the U.S. Mint’s state quarters program. I give the writer credit for not stating this story as 100% fact. But we Nutmeggers can – and will – continue to pretend. Hi: I live in Tennessee and my husband is from California. We are collectors of antiques & collectibles. In our travels we have acquired a gorgeous sillouette entitled “THE CHARTER OAK TREA” The Author is Taylor and the Date is 1856. I was going to put it on e bay to sell but wanted to contact some people up there. I didn’t realize it is such a part of your history. Would like to visit. If anyone is interested I can send pictures. I grew up in CT and having married a native Californian, now live here. I have been collecting memoribilia of The Charter Oak because some of my forebears (Great Uncle, Great Grandfather) received a piece of the Oak Tree for various reasons (prominent in CT at the time; President of Charter Oak Bank (G Uncle), President of the CT Historical Society). So I am curious about what you have? I have a Lithograph hanging in my library. I’d love to share photos, if you get this message. I am a decendent of Sir Edmund Andros, this much I know is fact. I have what I am told is a piece of the Charter Oak. It is only a small piece aprox. 10″x 6″ x 2″. I am sorry to say that my father had two CT. quarters implanted in it. I know there are so many claiming to have a piece of the tree, but I have always hoped that mine is the “real deal” considering my lineage. I have this cool old “Souvenir of the Centennial” book printed in 1877. It has a small 1″x1″ piece of wood in it from the Charter Oak tree. Is this rare? but, seriously, thanks Big Time for sharing all the delights of CT with us! My wife has a piece of the original Charter Oak Tree, her family was Ludington family of West Springfield. Dr. L.S.Ludington was married in 1840 served in the war and was discharged in June 1864. How she got a bit of the oak tree I will never know.